Which bath toys are making a splash in specialty? Read below to find out! TDmonthly Magazine interviewed specialty retailers to find out which bath toys were best-sellers in their stores. Learn more about the Top-10 Bath Toys below. *No manufacturer paid to be included in this article. All products listed were designated by editorial staff without regard to the company's relationship with TOYDIRECTORY.com/TDmonthly Magazine. 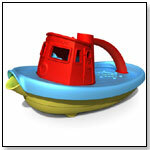 Tugboat by GREEN TOYS INC. Designed for ages 6 months and up, this toy for bathtubs and mud puddles is made in the USA of recycled plastic milk containers. It floats, is equipped with a spout on the front for scooping and pouring water, and is free of BPA, PVC, phthalates and external coatings. It comes in packaging made of recycled or recyclable materials and featuring soy inks. Launch date: March 2010. — In an April 2012 survey about bath toys, two of eleven retailers told TDmonthly the Tugboat from Green Toys was their best seller. — Kristen Dolle, Manager of Playthings Toy Shoppe in Louisville, Ky. named the Green Toys Tugboat as a best-seller in the bath category when surveyed by TDmonthly in late Spring 2011. This shaving set comes with a 7-oz. can of Foaming Body Soap, plastic play razor, shaving brush, comb and an unbreakable, child-safe mirror. Awards: iParenting Media Award; Parents Magazine Best Toys of the Year, 2004. — Retailers have been telling TDmonthly that Shaving in the Tub is a best-selling bath toy since 2007. Other Alex bath toys have been best-sellers in their category for several years as well. — Shaving in the Tub was specifically named as a best-selling bath toy by three of 39 specialty toy retailers in spring 2007. Only six of 37 retailers surveyed didn’t mention Alex when asked about best-selling bath toys. In March 2009, four of 64 retailers told TDmonthly this product is a best-selling bath item in their stores, selling anywhere from half a dozen to two dozen units each month. Nine of 39 retailers cited it as a best-selling bath product in March 2010. — As of 4/19/2012, this product had 4.5 out of 5 stars from 5 reviews on Amazon.com. Pros: Fun for younger kids; rinses easily; nice bonding activity for fathers and their kids. Cons: One reviewer said her child had fun with it once, but not a lot of creativity is involved and he lost interest the next time. — Want this? As of 05/06/2011, this product was available for purchase at My Imagination Station. Rub-a-dub-dub, there’s a big duck in your tub. Schylling Toy Company believes that bigger is better, which is why this duck is 12” long from beak to tail. The Large Rubber Duck comes with an assortment of hats for virtually any occasion a child might have in mind: rain hat, bonnet and sailor’s hat. — "Rubber duckies by Schylling" were bath best-sellers according to Tristan Hewitt, manager of Dragon's Toy Box in Seattle. Another agreed. — Both retailers noted that ducky sales are sporadic throughout the year. — Mike DiAndrea, manager of Hardware Toys/Big Smile Toys in Paoli, Pa., told TDmonthly in an April 2013 survey that they sell about 5 of this toy each month, making it a best-seller in the bath toy category. Submarine by GREEN TOYS INC. Colorful works of art can be created on someone’s tummy, or on the bathtub wall, using this set of six bathtub crayons. A duck-shaped sponge is provided to erase the “canvas” and start anew. “This is one of our top bath items,” said Elin Kabo, director of communications for Alex. — Ten of 64 retailers named the Bathtub Crayons from Alex as a top-selling bath item, citing monthly unit sales of anywhere from six to 80 per month, in March 2009. Nearly 70 percent of the respondents named the Alex line in general, or a particular product from the range, when discussing best-selling bath toys. — Eight of 39 retailers named this product a best-selling bath item in March 2010. Nearly 67 percent of retailers cited Alex as their No. 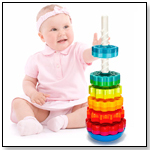 1 manufacturer for bath toys. — Want this? As of 05/06/2011, this product was available for purchase at Doodlehopper 4 Kids. Includes 5 colors of soapy finger paint, a fish-shaped sponge for clean up and a hand-shaped palette to hold the paints. Safe, clean and fun for kids. — In an April 2013 survey, two out of 12 retailers told TDmonthly that Paint in the Tub is one of their best-selling bath toys. The 3-in-1 Music Island includes three real instruments for the tub on a fish-shaped floating island. It's part of the famous Tub Tunes' line of bathtub musical instruments for toddlers. The Island includes a drum, xylophone and Octopus Jingle Shaker. It also comes with two mallets, music sheets and a music holder. — “Alex is where it is at for bath toys. We sell at least two a week,” said Alison Cox, owner of Animal Quackers in Raleigh, N.C.
— “Alex bath toys do well, all of them. We especially do well with Tub Tunes,” Patricia Masing, co-owner of Tree Town Toys in Ann Arbor, Mich., told TDmonthly in March 2008. — Five of 37 retailers cited the Tub Tunes' line as a hot-selling bath toy with customers in spring 2007. Thirty percent of 40 retailers who spoke with TDmonthly in March 2008 singled out this item as the best-selling bath toy in their stores. — Want this? As of 05/06/2011, this product was available for purchase at Hardware Toys. Mermaid Squirter by HABA USA/HABERMAASS CORP. This squirter measures 9 cm in length and squirts water for bath time fun. — In an April 2012 survey, Dean Smith, owner of JaZams in Princeton, N.J., told TDmonthly that they sell 2 dozen bath squirters from HABA each month. — In March 2008, Nancy Barringer, owner of Jamie Two Coats Toy Shop in Shelburne, Vt., told TDmonthly that these “little squirters” are so popular that her store has been selling 20 per month since Christmas. — Five percent of 40 retailers who spoke with TDmonthly in March 2008 singled out HABA toys as their best-selling bath toys. — Many other varieties are available, including a sea horse, pirate, ship, frog and fish. For ages 6 months and up. The bathtub is baby's ocean. 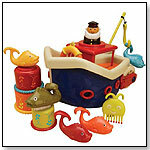 Set includes 13 toys in a floating boat; captain; life preserver; fishing hook & 4 ready-to-catch fish; 3 nesting cups that shower, stack & pour, octopus comb & whale nailbrush. Everything stows away below deck. Awards: American Baby Toy of the Year Award. — Mary Porter Green, owner of The Curiosity Zone in Ashburn, Va., told TDmonthly in a 2012 survey that their best selling infant & toddler products are from Toysmiths "B." line. "Though expensive, it has great packaging and is perfect for gift giving. Fish & Splish is an especially great product," she told TDmonthly. She also said this item was a best seller in the bath category. Mr. Bubble Foam Soap will whip up bath time fun. Kids can use their imagination to make all kinds of fun shapes with silly floating foam. Safe and gentle, it washes thoroughly and leaves skin soft and smooth. — Katie Roo, manager of Be Beep A Toy Shop in Columbia, S.C., told TDmonthly in an April 2012 survey about bath toys that they sell about a dozen units of Mr. Bubble Foam Soap each month. — In an April 2013 survey about best-selling bath toys Kate Noreen, manager of MudPuddles Toys & Books in Sherwood, Ore., told TDmonthly that "Mr. Bubble stuff has sold really well. It's that classic name, but it's thick foam so it's really fun to play with."